It may have become apparent to many update pack makers that Microsoft has made time zone updating more difficult since the release of August's cumulative update (KB970653-v3) by using TZChange.dll instead of the familiar TZChange.exe commands we've seen previously. While beyond my level of expertise, it seems that recreating these commands and using them alongside the registry entries in [Product.Add.Reg] in update.inf is now standard procedure for most. At first, for v2009-10_1 of my own update pack, I tried simply using the entries in [Product.Add.Reg] at both T~20 and T-13, hoping it wouldn't be necessary to recreate the missing commands. This didn't work because the "HKLM\SYSTEM\CurrentControlSet\Control\TimeZoneInformation" key was populated before then, using the old data, with no obvious way of refreshing the information afterward. One symptom, as reported to me by Kurt_Aust, was that the DST offset for "(GMT+10:00) Canberra, Melbourne, Sydney" was not applied when it should be. The end-user could fix this by changing away from, then back to the desired time zone. I fixed this by adding the new time zone entries from [Product.Add.Reg] during textmode using the [HiveInfs.Fresh] section of TxtSetup.sif, in addition to adding them at T-13. This worked, but, upon further investigation, the "(GMT+08:00) Perth" zone wasn't updated compared to a machine upon which the original KB974176 update package was installed. The following image is what the selection window should look like, but the area selected by the red oval still showed the DST adjustment checkbox, which was incorrect. I used user_hidden's 1.1.1 update pack on my x86 machine here and it shows the same incorrect checkbox before updating to the latest cumulative time zone update. I must assume that all other update packs using the same method with commands and [Product.Add.Reg]-based update methods produce the same result. Something is wrong with this method. There may be other lines that are incorrect compared to what ends up in the registry, but I don't want to ruin my eyes looking for them all. [Product.Add.Reg] contains bad information and should not be used. Most importantly, the correct registry entries are added. The entries are added as early as possible, before the "HKLM\SYSTEM\CurrentControlSet\Control\TimeZoneInformation" key is populated later in GUImode setup. No bulky TZChange.exe commands need to be reverse-engineered or used at all. Have I missed anything? Please, let me know what you think. Last edited by 5eraph on Fri Dec 11, 2009 8:37 am, edited 2 times in total. The [Product.Add.Reg] section may have been faulty then, as well. Importing a properly updated key should solve this problem. Last edited by ricktendo64 on Wed Dec 02, 2009 1:39 am, edited 2 times in total. It's possible that you are using better commands than user_hidden, but I have no way of testing your update pack to be certain since I use ENU. Recreating the commands seems like a lot of extra work to me. You have more patience than I.
Yeah, I couldn't use the new indexes in WinNT.sif either. It made sense to me at the time. It seems that the index values are hard-coded during setup. New, unrecognized values cause Windows to prompt the user to choose among the old set of time zones, even when the new ones should be available from the start. Time zone order doesn't seem to be an issue for me, attended install or not. 5eraph wrote: It's possible that you are using better commands than user_hidden, but I have no way of testing your update pack to be certain since I use ENU. Recreating the commands seems like a lot of extra work to me. You have more patience than I..
my [T13.UpdateTimeZones.AddReg] section is taken fron the registry and not the update.inf, are you saying there is an error? There was an inconsistency with v1.1.1. I haven't tried a newer version, but it seems to be corrected with the command line in v1.1.4 if I'm reading it right. Apparently, there are differences between the KB974176 packages for XPx86 and XPx64. The package for XPx64 actually removes DST for Perth in 2009, as described in the article, where the XPx86 package does not. I'm sorry for the confusion. I blame Microsoft. 5eraph wrote: I'm sorry for the confusion. I blame Microsoft. 5eraph wrote: Apparently, there are differences between the KB974176 packages for XPx86 and XPx64. 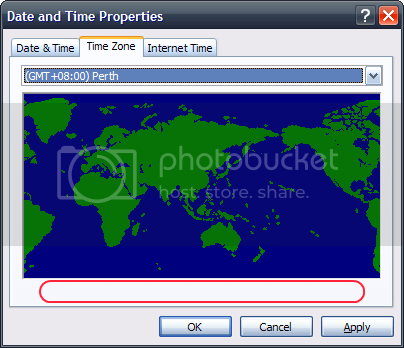 The package for XPx64 actually removes DST for Perth in 2009, as described in the article, where the XPx86 package does not. As mentioned by user_hidden, here's the script I'm currently using to create the text-mode registry hive file. Basic directions are in the CMD file. [2011/12/22 22:00 UTC] - 2011-12_3 - Can now sort entries alphabetically; read CMD notes for more details. Added a couple tweaks "under the hood" for when this script is called from another script. [2011/12/16 20:25 UTC] - 2011-12_2 - Now detects values and keys removed by an update package, even though no update package does this yet. These entries will appear in a [DelReg] section at the beginning of the output file when present. [2011/12/15 17:35 UTC] - 2011-12_1 - Initial release. Last edited by 5eraph on Thu Dec 22, 2011 4:58 pm, edited 7 times in total. TZScript updated again. It's good enough for me, so this'll be the last I look at it for a while.